One for the sadly cooling weather - a heartwarming, spicy soup. This was made for Siren Magazine and is vegan. Parsnips are one my my favourite winter vegetables and they are in season at the moment. I am most familiar with them as an accompaniment to a Sunday roast, but they make an excellent soup too and they hold their own against an assortment of spices. For those less than enamoured with the thought of using soy cream (though I urge you to try it, it works beautifully adding a hint of creaminess to the soup), you can replace it with either single cream or fat free natural yogurt for a healthier alternative. Turn the oven on to 180°C and bring up to temperature. Meanwhile, chop the parsnips and onion into wedges and transfer to a large roasting dish. Combine all the spices (apart from the fresh ginger) in a bowl and then sprinkle over the parsnips and onions. Drizzle olive oil over the vegetables, give them a toss and then place in the oven for 35 minutes, or until the parsnips are soft. While the parsnips and onions are roasting, peel and chop the garlic, then peel and chop the ginger. Add them to the roasting vegetables about 10 minutes before they are ready. Once done, in batches, transfer the roasted vegetables, along with 2-3 ladles of vegetable stock to a blender. Blend until you have a purée, then transfer to a large saucepan lined with a sieve. You want to push the soup through a sieve to get rid of any lumps and bumps. Once all the ingredients have been blended and sieved, turn the soup on to a low heat to warm through. Once warm, add the soy cream and stir in. Keep on heating the soup until it is piping hot, but do not allow to boil as the cream will curdle. Finally, finely chop the fresh red chilli, taking care to discard any seeds. 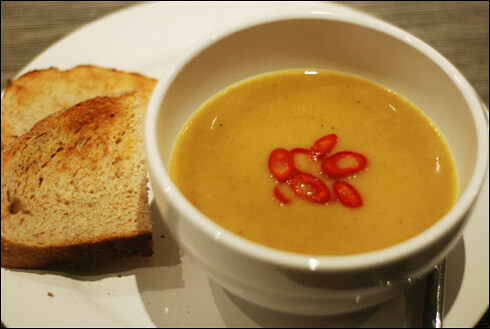 Transfer the soup to bowls and then garnish with a few slices of chilli per bowl. This sounds lovely! I tried a similar recipe the other day, but with butternut squash and lime (I did find that in a recipe book, I didn't just make it up!). Unfortunately the lime was so strong it completely overpowered every other flavour and the result was, essentially, lime soup. Erk. It reminded me of the time I accidentally blitzed a chunk of lemon into some chicken stock and ended up with, yup, lemon soup. Note to self: citrus fruits do NOT work in soups!